We provide recruitment and staffing solutions that work. At Dominion Healthcare LLC, this is more than just our mantra. This is our way of life. We are here to help clients whether individuals or agencies to meet their patients or clients needs by providing them with the right people who can deliver their promised quality of services for them. When you have a steady source of skilled manpower, you can be almost sure that you have a steady number of clients who are as delighted as you are for having the right people serving you. Our CNAs and HHAs are experienced and skilled to properly respond to the care needs of individual patients and corporate clients. You can trust that Dominion Healthcare LLC only endorses care experts who can be trusted to deliver our promised brand of care. We provide Nursing services. 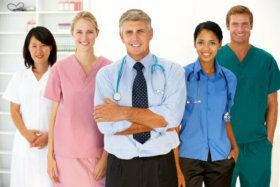 Our bi-lingual nurses who have undergone rigorous trainings and evaluations provide education assessment of patient’s condition, medication teaching, awareness of drug interaction, home care services in the following languages: English, French, Haitian Creole, Cape Verdean creole, Spanish, African creole. We provide medical assistants who are skilled and trained to carry out proper monitoring, recording, and reporting jobs needed for any agency or facility to deliver comprehensive services to their clients. For more information about the other staffing services we provide, you may contact Dominion Healthcare LLC at 617-690-2323 anytime during office hours.